1. 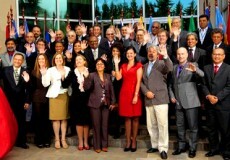 That the Eighteenth Forum Ministers of Environment welcomed the First Meeting of Ministers of Environment of CELAC, in response to the Caracas Action Plan of CELAC of December 2011. 2. That a regional proposal should be developed to strengthen the governance and the institutional framework of the Forum of Ministers of the Environment of Latin America and the Caribbean. 3. That the results achieved during the Eighteenth Meeting of the Forum of Ministers of Environment of Latin America and the Caribbean and during the First Meeting of Ministers of Environment of the Latin American and the Caribbean Community of States, -CELAC, have to serve the purpose of providing a regional vision with the aim of becoming one of the central bases and platforms for the negotiation towards Rio+20. 4. That the Meeting of Ministers of the Environment of CELAC, as a mechanism of political consultation, shall be strengthened so that the region can build a vision of integration for sustainable development. 5. In order to accomplish the purposes, objectives and goals of sustainable development, the scope of the following rights, among others, should be taken into account, in an integral, complementary and interdependent manner: the rights of people and states to development, which implies the recognition of the rights of populations to overcome poverty, the elimination of conditions that generate inequity and social exclusion, the exercise of the rights in harmony with nature, respecting Mother Earth, and the rights of indigenous people and local communities, under the principles of Agenda 21 and other relevant instruments. 6. That regional financial mechanisms and structures should be strengthened and/or created to guarantee the provision of resources to support the countries of the region in the implementation of activities for sustainable development. 7. To urge compliance with the historical commitment of developed countries to allocate 0.7% of GDP to official development assistance. 8. To urge developed countries to increase their financial commitments to address mitigation and adaptation for countries of Latin America and the Caribbean, with new, additional, sufficient and non-conditional funds, based on the principles of common but differentiated responsibilities. 9. That we urge developed countries to meet and increase their commitments in favour of Latin American and Caribbean countries for adaptation, capacity development and technology transfer according to the United Nations Framework Convention for Climate Change and its corresponding instruments. 10. That we urge developed countries to comply with their mitigation commitments under the Kyoto Protocol; and to define and comply with more ambitious Greenhouse Gas emissions reduction goals and clear commitment periods under compliance mechanisms. 11. That it would be useful that, during the preparatory process for Rio + 20, topics related to the sustainable development objectives should be defined, within the framework of the proposals of new development models, taking into account the characteristics of universal scope and national implementation, integration and complementarity, keeping as a reference the Millennium Development Goals (MDGs), without prejudice to their implementation, and the process of formulation of sustainable development goals be identified after Rio + 20. 12. Our solid commitment to continue our efforts at all levels in order to progress in the transition towards sustainable development, as this represents the adequate strategy to reach objectives of social welfare, economic growth, environmental protection and sustainable use of natural resources in a harmonious way, as well as the development of strategies to avoid hidden trade restrictions. 13. That, within the elements of building a common vision to achieve sustainable development, the recognition of the limits of nature, its importance for life and the promotion of a harmonious relationship with nature, the promotion of all human and collective rights, intergenerational justice and solidarity, social and economic inclusion, should be promoted respecting the cultural and social diversity of the communities, peoples and nations. 14. That, commitments should be made for the full implementation of the rights of access to information, participation and environmental justice, as stated in Principle 10 of the Rio Declaration, understanding them as indispensable pre-requisites for the construction of a citizenship committed to sustainable development. 15. That regional cooperation should be increased in the areas of education, technological professional training, knowledge transfer of science and clean technology, and revalorization of traditional knowledge of indigenous peoples and communities, highlighting the ancestral knowledge. 16. That a joint position should be promoted to create enabling mechanisms for technology transfer and capacity building for the benefit of developing countries that allow greater dissemination of those technologies, adapted to their national realities, and which can make the difference in the reduction of environmental impact and contribute to sustainable development. 17. That, to achieve sustainable development, respect for the biophysical limits and vital cycles of nature should be promoted, as well as poverty eradication, reduction of the gap between rich and poor, ensuring social inclusion as essential goal to attain sustainable development within the framework of a more supportive and inclusive economic order. 18. That, in the framework of the Rio+20 Conference, a universal declaration of the rights of nature should be discussed as an instrument to achieve good living. 19. That, in the framework of adoption of a regional environmental agenda, South-South cooperation will be strengthened for an effective articulation of the pillars of sustainable development in a balanced, comprehensive and global manner, with the preparation of integral tools to support planning. 20. That, in the future institutional framework for sustainable development, the roles and mandates of the United Nations bodies should be revised in order for them to effectively interact in a coherent, coordinated and cooperative way without overlapping similar agendas, functions and problems. 21. That we support the strengthening of the environmental pillar through an institutional framework that guarantees technical, financial and scientific capacity to be the catalyst for international cooperation on environmental issues and sustainable development. 22. That, the cooperation for the development of regional strategies, based on national realities, should be promoted to generate synergies among the conventions and multilateral agreements, as well as experiences exchange and support to innovative public policies initiatives. 23. That we encourage the Rio+20 Conference to consider, in the context of food security and agricultural development, the excessive volatility of food prices and the speculation in the commodities markets, as an emerging issue and a factor that threatens the goal of poverty eradication in developing countries. 24. That we urge developed countries to end the volatility in commodity prices at a global level and the definition of respective prices, caused by financial speculation and regardless of environmental and social considerations, which compromises compliance with sustainable development to which the Latin American and Caribbean countries are committed to. 25. That one of the main objectives of the Rio+20 Conference is to agree on a renewed vision of, and commitment to, sustainable development for poverty eradication and the promotion of social inclusion and equity and that, therefore, this will be an indisputable opportunity to orient our efforts towards the construction of a new international economic order that is more fair, equitable and inclusive, and that overcomes the wear, discredit and limitations of the current development model. 26. That we should continue to strengthen and enrich the work of the ILAC on indicators of sustainable development, gathering them, as a complement to the Millennium Development Goals, as inputs to the development of the sustainable development goals to be defined in Rio + 20. 27. That we recognize the vulnerability of landlocked countries and, honouring the solidarity and the responsibilities in ensuring the right to maximum development of the potentials of these countries, we express the need to make them visible including a specific mention to them in the documents produced by the Eighteenth Meeting of the Forum of Ministers of Environment and the First Meeting of Ministers of Environment of the CELAC. 28. That the Forum of Ministers adopts the working group established during the First Meeting of the Ministers of the Environment of CELAC as a response to article 1 of the Decision 1 approved in the Eighteenth Forum of Ministers of the Environment, and modifying its composition. 29. That we request to the Presidency of the Forum of Ministers of Environment of LAC to communicate to the Secretariat of Rio+20 and the Pro Tempore Presidency of the Community of Latin American and Caribbean States the results of the Eighteenth Meeting of the Forum of the Ministers of Environment LAC and the First Meeting of Ministers of Environment of CELAC. 30. That we recognize the excellent work of the Minister of Environment and the Minister Coordinator of Heritage and thank the people and the Government of Ecuador for their hospitality, leadership and contribution to host the Eighteenth Meeting of the Forum of Ministers of Environment of Latin America and the Caribbean, and the First Meeting of Ministers of Environment of the Latin American and the Caribbean Community of States, -CELAC. 31. That we thank the United Nations Environment Programme for its support to the organisation of the Eighteenth Meeting of the Forum of Ministers of Environment of Latin America and the Caribbean.